It is hard to organise a trip with your girl friends BFF many years after school, as each of us is having our own agenda. Some married, some with kids, some busy with work, some living in other countries, and etc. But the 4 of us somehow still managed to go for our second girlie trip last year, and to make it more fun, we tried to line up with fun thing to do. Four of us ended up with an agreement to go for a cooking class, our destination is Phuket in Thailand, and we found this nice place called Blue Elephant, it is a well known restaurant, and they also do cooking class. 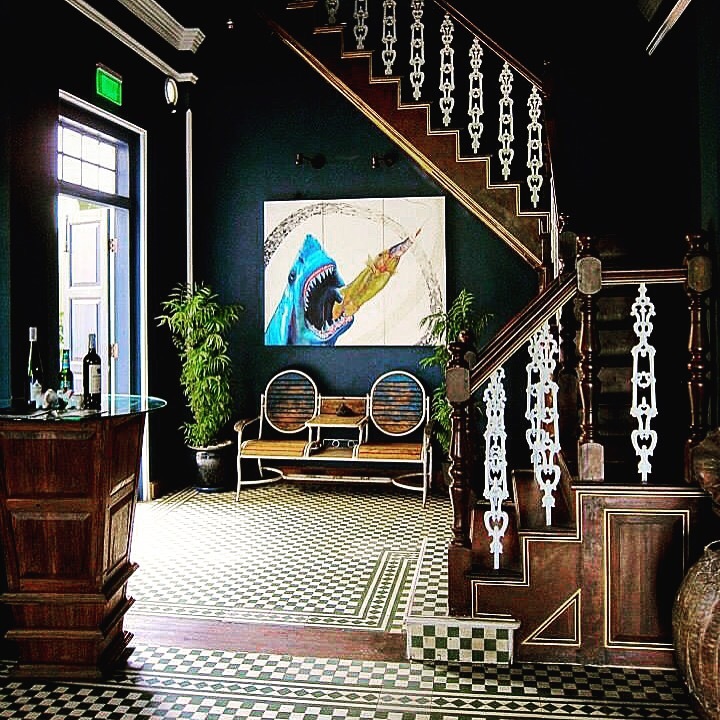 Arrived to this beautiful building, and actually the entire building with old Chinese-colonial style is the Blue Elephant Restaurant, with a huge lawn and very old trees. I heard that it was a government building, and the owner bought the whole building and keep the look for the restaurant, it is nicely decorated and I love the style! The restaurant itself is quite well-known, with brunches all over the world in different countries, for example London, Paris, Brussels, Dubai, and etc. 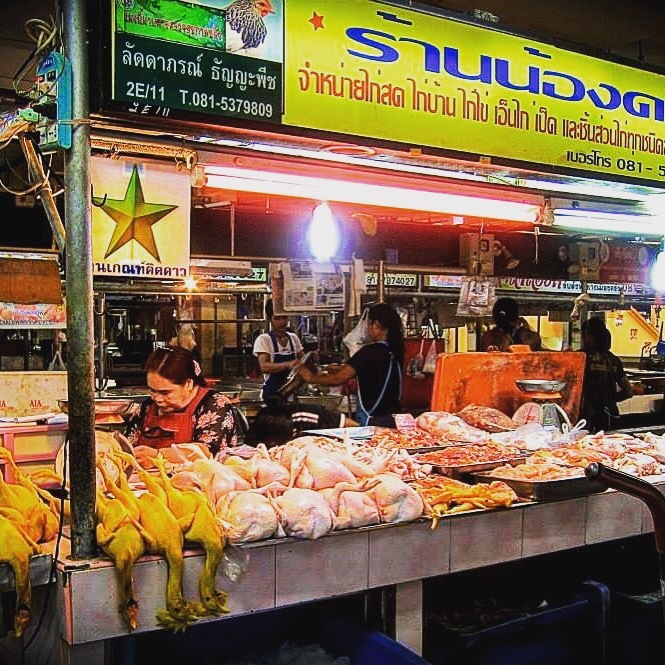 The first thing we need to do is a tour to the wet market nearby, not really doing shopping, but in order to understand the ingredients of Thai food or how do they look like, the best place to go is the market. It’s actually quite interesting to go around the market, and having someone can speak with the locals with you is great. I’ve learned different kind of vegetables and herbs that are originated in Thailand. It was definitely a nice experience. wet market in Phuket, Thailand. Those yellow chicken are marinated with turmeric. So, let’s start cooking! Basically, they prepared all ingredients for you, you just need to cook. Our class is to learn 4 dishes, the first one is Keang Ka-Ree Koong Subparod (Yellow Curry with Prawns and Pineapple). The most important thing to learn is how to make the curry paste, everything is about grinding with the mortar. So, you need to work out your muscle in order to grind the curry paste. Basically, the red curry paste is the base, and to make the yellow curry paste is using the red curry paste to add yellow curry powder and turmeric powder. The ingredients are garlic, coriander root, yellow curry powder, turmeric powder, red curry paste, vegetable oil, coconut milk, prawns, pineapple in thinly sliced, cherry tomato cut in half, sweet pepper and onion. 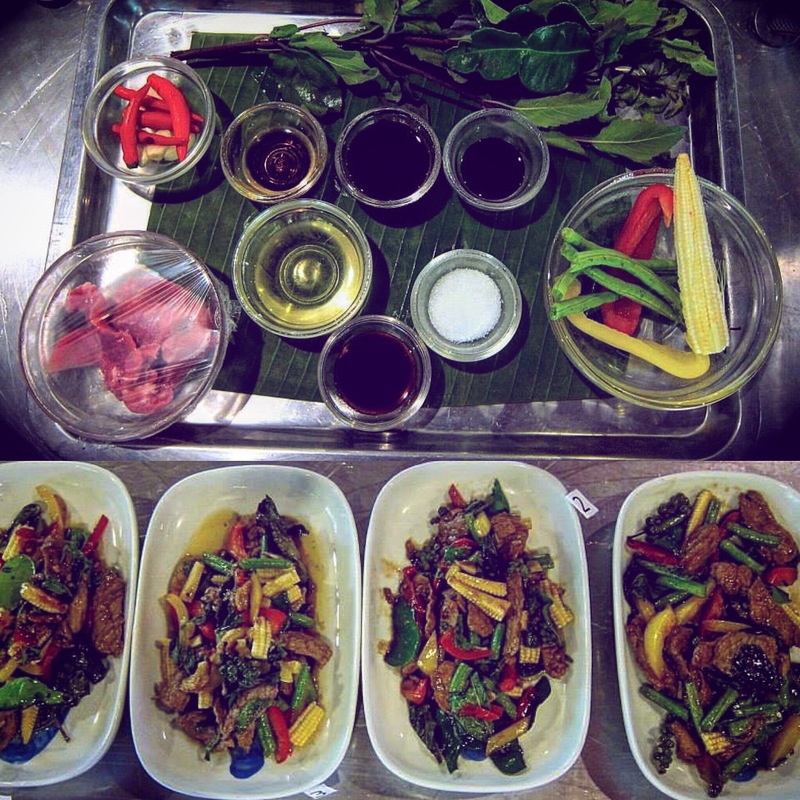 This dish is not difficult, most of the work is about making the red curry paste. The second dish is Hor Mok Poo Tod (Fried Crab Soufflé), for this one you need to whisk a lot, another way to build muscle. 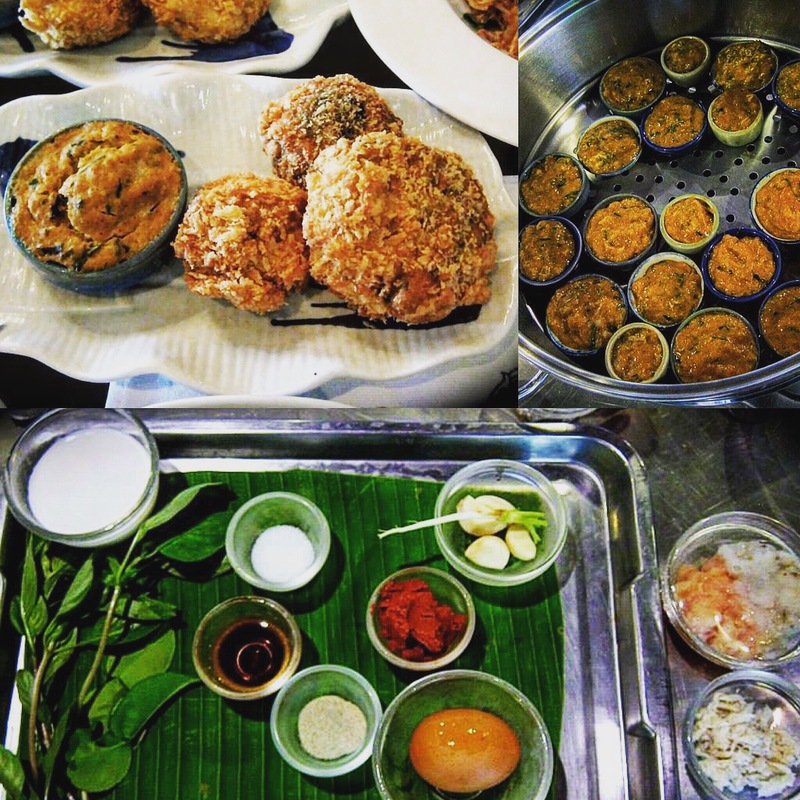 For this dish, we have to mix the ingredients in a big bowl, first to mix the paste, egg yolk and coconut milk, then have to mix the minced chicken, minced prawn, steamed crab meat, kaffir lime leaf, sweet basil leaves, then add fish sauce and sugar. Place the mixture into crab shells or containers, and steam that for 15 minutes. Dip with beaten egg, then coat with breadcrumbs, and deep fry. The teacher said that this Phad Ka-praow Nua (Stir-fried beef with holy basil) is one of the most popular, cheap and cheerful dish in Thailand. Basically is to fry the sliced beef with holy basil, with the garlic and chili paste, kaffir lime leaf, green peppercorn, sliced of red and yellow chilies, chicken stock, young baby corns and long bean. Season it with light soya sauce, fish sauce, oyster sauce, sugar and sweet dark soya sauce. The last dish is the Yam Som O (Pomelo Salad), always love to eat this one, let’s see how to make it. 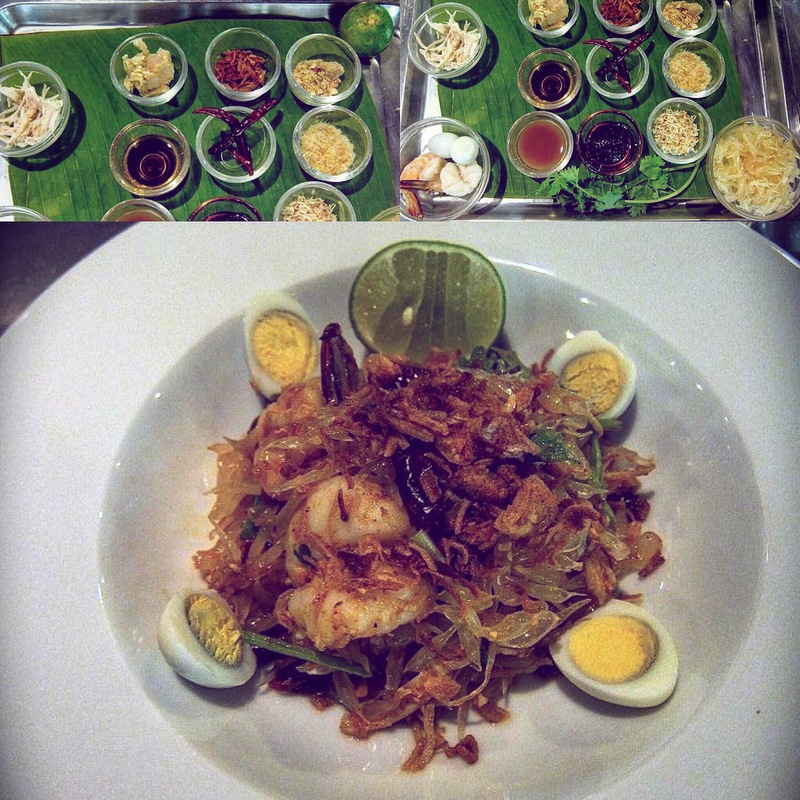 The salad ingredients are pomelo, cooked prawns, chicken, ground dried shrimps, roasted peanuts and desiccated coconut. Mixed the ingredients together and add the dressing, chilli paste, tamarind juice, palm sugar, fish sauce and lime juice mixed well together. Garnish it with deep fried shallot, deep fried dried red chili and boiled quail’s eggs. Some Thai ingredients that I learned and it’s quite new to me, holy basic leaves, kaffir lime leaf, galangal, tamarind, coriander root (don’t know you can cook with the root). Each of us got a certificate and some gifts home, few ingredients to bring with us, such as fish sauce, curry paste and kaffir lime leaves. We also got to sit down and have lunch together and enjoyed what we cooked.